There has been much speculation about Hillary Clinton for years. She is ambitious beyond parallel and everyone knows that “the only thing evil loves more than innocence…is ambition”. She has been seen wearing an illuminist Phoenix pendant , hails from zip code 60606 Chicago, the Phoenix City in that it rose from the ashes of the Great Fire and she met her husband Bill Clinton – a former De Molay masonic youth and Cecil Rhodes One World Government Rhodes scholar in Oxford- at Yale University law school. As many suspect, Yale is essentially a Secret Society coven-complex which uses its status as an ‘elite’ University as a cover. 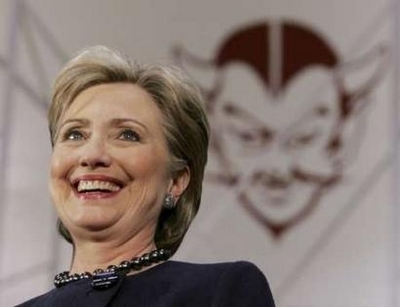 The following information should leave little doubt – especially when combined with all of the other matters- that Hillary Clinton is a practicing Satanist. If she becomes President – it will not be a huge change, she will merely replace the current Skull and Bones Satanist that is there today. 1. Hillary Clinton was the Director, not just a ‘bit player’ of the New World Foundation in New York City. ThisFoundation funded virtually EVERY radical / communist / abortionist / bizarre cause and group imaginable. http://www.jewishworldreview.com/0598/gahr1.html and phoenix pendant = http://www.cuttingedge.org/news/n1259.cfm . 2. Hillary Clinton wrote a favorable critique of a piece calling for “An American Kampuchea”. This of course was the name Pol Pot and the Khmer Rouge gave to Cambodia when they assumed power. Anyone reading this is familiar with the photos of the mounds of skulls. According to the following link Mrs. Clinton had a ‘rasputin’ or guru that produces the Tikkun magazine. The Tikkun publisher is Michael Lerner. http://www.thenewamerican.com/tna/1993/vo09no14/vo09no14_hillary.htm . 3. The New World Foundation funds come from Anita McCormick Blaine. She was the daughter of Cyrus McCormick the inventor of the mechanized reaper. She founded the Chicago Institute over a century ago. It became part of the Rockefeller created University of Chicago in shortly thereafter. http://www.ucls.uchicago.edu/photo_album/1890s/anitablaine.html . 4. Needless to say – Ms. McCormick Blaine was involved in the Occult. She favored a One World Government and furthered so called far-left radical causes. She “became interested in Spiritualism” . http://www.lib.uchicago.edu/e/spcl/excat/donors2.html . 5. The previous link indicates that Ms. McCormick Blaine was a supporter of Henry Wallace in his run for the White House in 1948. Mr. Wallace favored a ‘soft’ policy on the Soviet Union and had heavy Communist Support in the USA. Also “Wallace was a lifelong student of … various oriental cults, mysticism and numerology. ” … Yes that is correct that is what this article is concerned with : Numerology… 666. The article also notes he considered Nicholas Roerich possibly his Guru. Roerich was considered a “god” by his followers. Again, that is what 666 is about -it as the Bible says is the number of a man. A man that would become “like unto God”. http://www.americanheritage.com/articles/magazine/ah/1976/1/1976_1_42.shtml . 6. As many readers may know, Henry Wallace was a Freemason and he was the man responsible for placing the Eye of the Illuminati in the pyramid on the US One Dollar Bill. http://www.wealth4freedom.com/dollarbill.html / http://www.conspiracyarchive.com/NWO/All_Seeing_eye.htm . 7. Dan Brown, author of the Da Vinci Code indicates that the Illuminati infiltrated the freemasons and used the eye pyramid symbol as “their brand” on the dollar bill. If so, then former Vice President of the USA Wallace as the man responsible for the Eye/pyramid being on the dollar – MUST BE ILLUMINATI. http://www.danbrown.com/secrets/bizarre_facts/angels_demons.html . 8. Tell me who you’re with and I’ll tell you who you are…Remember the saying? If Ms. McCormick Blaine was into “spiritualism” and decides to be the major funder of a member of the Illuminati that places the eye of Horus over the pyramid of Giza on the US Dollar then in all likelihood she was connected to the Illuminati. Now… her “charitable foundation” is located in a 666 building in New York City and it was run by none other than phoenix pendant wearing Yale graduate – power and ambition obsessed – future President of the United States- Hillary Clinton. Conclusion: Hillary Clinton is a powerful member of the Illuminati. She will be our next President. She will inherit all of the powers the Bush administration has now amassed in the Government under the guise of a false flag created war on terror. She will further the mission of One World Government and there will be little to stop her. Time to Pray…. As Skripal-Gate Collapses, Will the May Government, Too?